This is the official Yahoo “employee welcome” kit. 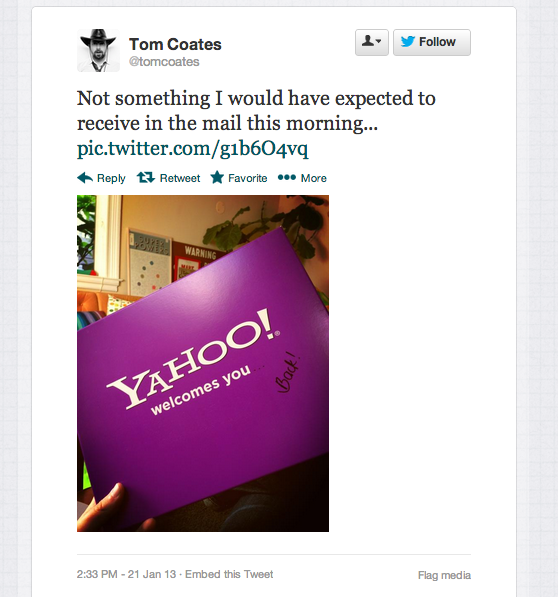 Except the employee in question, founder Tom Coates, doesn’t work at Yahoo. He used to. Over the past couple of months, Yahoo recruiters have reached out to ex-VPs, low-level engineers and PMs who used to work for Yahoo with these packets, with the word “Back!” scrawled on them in black Sharpee. On the packet inside is a bunch of copy about how much has changed since the new Marissa Mayer regime, and how Yahoo wants to talk about “big opportunities.” “I’ve heard they literally cannot buy people,” said one recipient of the packet, who passed on whatever the big opportunities are. While I have no idea how many packets were sent, I’m hearing that apparently quite a few former Yahoos have been on the receiving end, with at least one person moving back to the company because of it. This is definitely a pretty aggressive way to initiate contact with talent, but it makes sense. Many of the Valley’s most talented workers will likely not return email or calls from Yahoo. And we’ve actually been hearing that Yahoo’s M&A efforts have been stalling for months (more in a later post) because of mismanagement, the latest victim of offer-rejection being the Yahoo! Answers product for Mobile. “They are incapable of doing deals right now and it’s an open secret,” said one source familiar with the matter. So any way to get offers in front of people is a way to get offers in front of people. But, if Yahoo recruiters were really smart, they would enlist a high-ranking executive (ideally Mayer) to reach out in a meaningful way to former employees. We’ve heard that the Stamped acquisition only went through because of the direct involvement of the charismatic CEO with the former Googler co-founders. Mayer also recruited her former colleague Henrique De Castro to be COO, though the pile of money he’s had thrown at him probably helped — $56+ million is indeed quite a welcome.